Adventure and Biodiversity in the Cloud Forests of Mindo . . . This Study and Travel option (photos above) spends a week exploring the diversity of the cloud forest in the area around Mindo. The cloud forests of this area contain an enormous wealth of unique flora and fauna, from butterflies to hummingbirds, orchids and ferns. 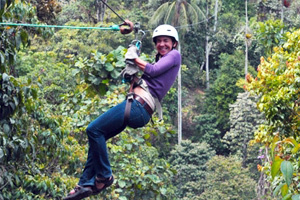 Your stay in Mindo will also include plenty of fun and adventure during the week – tubing, rapelling, ziplining, etc. Students leave on Monday morning with their teacher for the 3 hour bus ride to Mindo. The program ends on Friday after classes in the morning and you are free to either return to Quito with your teacher or continue to explore the area on your own. There are various trips and tours available on the weekend. The spectacular cloud forests around Mindo are home to an immense biodiversity. They are characterized as an area of evergreen forests on the sides of high altitude hillsides, often draped with mosses due to the consistent condensation of water from the atmosphere. In contrast to the regular downpours of rain in the rainforest of the Amazon, in the cloud forest there is a more constand dampness resulting from settling clouds that drift through the area. The resulting environment is ideal for a wide variety of bird species including hummingbirds, and, frogs and other anphibians. In addition there are many varieties of ferns and orchids. "I spent a week in Mindo studying Spanish with my teacher from Yanapuma and I thoroughly enjoyed it. We hiked, rapelled, tubed on the river, bathed in pools beneath waterfalls, ate freshly caught fish, and relaxed in the evening with a cold beer listening to the chorus of the insects and frogs in the dark!"